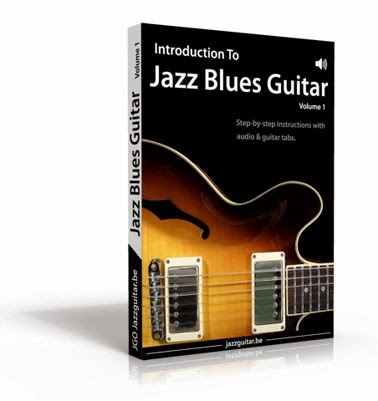 Introduction To Jazz Blues Guitar Volume 1 is a comprehensive program to help you develop your jazz-blues chops quickly. The opening chapters on chords and progressions takes us through Freddie Green's use of shell-voicings, adding ii-V's, as well as spicing up the basic blues progression with VI7b9 and #IVdim7 chords. The great thing about the e-book format is that it allows embedded audio files to be played by clicking a link within the page itself. While nothing really new or groundbreaking, I found this feature useful when scanning through the various chapters looking for licks I wanted to steal! I also especially appreciated the Blues Chord Change Overview chart where one can simply mix and match different components of the concepts discussed and come up with new variations of the progression while still maintaining the logical sound of the blues. This approach is a lot better than giving the reader 10 or 15 jazz-blues progression variations to memorize. This e-book course really shines with the following chapters on single-note improvisation. The scale topics covered here alone are pretty extensive, and include major blues scales, minor blues scales and 7b9 pentatonic scales. All are presented in their five forms on the fingerboard and demonstrated with many solo examples, with clickable accompanying audio. Application of the scales over chord progressions are also thoroughly addressed with the emphasis on playing over each chord with a different scale. So if you've been stuck in a one pentatonic-scale-fits-all approach for years, prepare to break through this wall forever. And if you've never heard of the 7b9 pentatonic scale, or don't know how it can be used in a jazz-blues progression, then the three chapters devoted to this scale are alone worth the price of this e-book! For good measure, whole chapters on bebop scales and bebop vocabulary, chord-scale soloing, arpeggio licks, and essential jazz-blues vocabulary are also given due coverage. And to help you put your new ideas into practice, several blues backing tracks, each in both fast and slow speeds are also provided. While the extensive amount of information in Introduction To Jazz Blues Guitar Volume 1 may not be new to very experienced players, learning these concepts will definitely open more than a few doors for the intermediate to upper-intermediate jazz player. Also highly recommended for the seasoned 12-bar blues veterans who are trying to break out of the pentatonic box and add a bit variety and sophistication to their playing. The is very useful to me as well. I must follow the content for me as well. I must follow the discussion which is very useful to me as well. Keep it up.